The Media Research Center studied all broadcast evening news coverage of President Trump from January 1 through April 30, and found 90 percent of the evaluative comments about Trump were negative — precisely the same hostile tone we documented in 2017. But unlike last year, when the RealClearPolitics average depicted a slow but steady erosion in the President’s job approval numbers, the public has apparently warmed to Trump in 2018, even as the networks [continue their negative coverage]. Trump’s overall job approval rating actually rose, from 37 percent in mid-December to roughly 43 percent at the end of April. For this report, MRC analysts examined all 1,065 network evening news stories about President Trump and top members of his administration during the first four months of this year. The coverage totalled 1,774 minutes, or roughly one-third of all evening news airtime. Nearly two-fifths (39%) of the TV coverage we examined focused on Trump scandals and controversies, while 45 percent was devoted to various policy issues. The remaining airtime was spent on controversies involving other top Trump officials, such as EPA Administrator Scott Pruitt, or did not involve specific topics. Network coverage of those topics, plus a host of other smaller controversies involving the President, was almost entirely negative: of the 598 statements we tallied about Trump’s personal controversies or scandals, virtually all of them (97%) were negative. …Of the 542 opinionated statements involving a policy matter, 440 (81%) were negative, compared with 102 (19%) which were positive. The policy stories earning the most TV airtime in 2018 were immigration (167 minutes), the economy (117 minutes), North Korea (111 minutes), Syria (89 minutes) and gun rights (57 minutes). 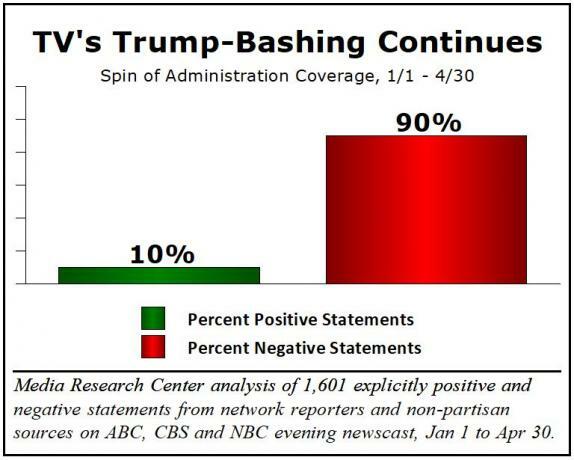 The networks’ spin on [Trump policies on] immigration, Syria and gun rights was extremely negative (between 88% and 96% negative). And, despite the potential of a breakthrough with North Korea, the coverage of that topic was tilted two-to-one against the President (68% negative vs. 32% positive). The President’s handling of the economy was a mixed bag. A majority of the networks’ airtime (66 minutes) was devoted to Trump’s decision to impose tariffs and threaten a wider trade war with nations such as China, an aspect of economic policy which drew mostly criticism (90% negative). But the remaining airtime (51 minutes) . Less than 3% of TV’s total coverage of the President this year consisted of mostly positive coverage (73%) for the rest of Trump’s economic agenda: job growth, tax reform, deregulation, and plans for more infrastructure spending. 1. Why do you think the media reports negatively on Trump to such a degree? 2. What effect does this type of reporting have for a person who does not follow the news but just reads headlines or hears news clips here or there? How does the media report on these positive accomplishments?